I am starting and hope to use this thread to identify and coordinate wiki work. Feel free to post what needs to be added, updated, or corrected on the wiki. I would also like to identify who has access to the wiki. Please post if you have access and maybe some strengths you can bring to a section or certain format like tables or graphics. Once we start to get organized, we can start delegating and moving the work forward. A couple of things I would like to mention. 1. Jam approves wiki access. b. The HELP is really part of the wiki and we should be taking care of it also. iii. I am happy to help organize, but I am not the boss. Just someone willing to help as needed. We work at this together. four. Wiki coding is a little different, so if you do not know much, but are willing to learn, you can do it. So please post here if you have access to the wiki and what you are good at or enjoy doing. Thanks and looking forward to moving things forward a little. One last thing. While it will help to have several helping, everyone doesn't need to help and too many hands in it can make things messy. So if this is not your thing, that is fine. If it is, or you want it to be, then request access and come on board. We will have lots of fun!! I have been working on the wiki off and on for months. NPC Pilots, Materials and a few other pages are examples of my work. This is the first wiki I've worked on, and I only work on it because I love the game and the wiki has been in such a sad state. I would like to see 3 main sections for the wiki. 1) Ascent.exe user guide. How to install the game, how to change settings, how the accounts are made/modified, and Player resources, like support/forums/IRC. 2) The main "manual", where concepts are taught and walkthroughs given. 3) References. Where we can look up every game item and see info specific to that item. We could use a map of conceptual player tasks/jobs. Trader, Miner, Ship Builder, etc. So that we can start applying a systematic approach to making wiki pages and linking them together correctly. For me, the wiki is a place to get people started, not to answer all questions. Much of the game is to figure things out. Basics are good, but we also can not answer every question or issue and so doing, we might take away some of the fun and challenge of figuring things out. There are some things we can build into tables though. I think this would be useful since so much of the data would function well in table format. On the ship page, a list of items each ship needs would be helpful, but we would not need to spell out every ship since each use the same, just different cl levels. So as we move forward, I would like to keep the concept of keeping it pretty simple. I think the first move would be getting the existing wiki up to date on things. We can look later about redoing or changing some things. The original idea was to step from one page to the next and have the wiki match the progress in the game. Some of that has changed since the page links are in the nav bar. 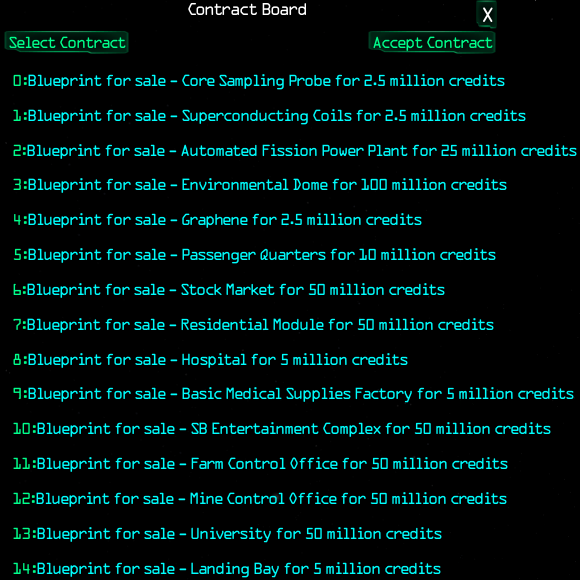 On the wiki http://wiki.thespacegame.com/mediawiki/index.php/Completing_Contracts there is a picture with Deep6 Blueprints for sale there. Thanx to all in chat who were so patient with me to explain where to find these modules. I have done professional WIKI work in my old job, we had an internal company wiki server for all of our security operations support needs. Easy click and lookup How to sections...Look up for processes etc and check lists. More or less something like the tutorial with steps laid out. Tables galore of course cause you can't do checklists without tables. Pictures make all the difference, so also did a lot of screen capture and referencing in wiki action steps. I can help out but don't want to lead anything, just let me know if a section needs help and I can help where I can with it. Say over haul the ship, class, module, mat, projected costs level etc. (retail or to build). *Has there been an update showing the Bow and Hawk available as DLCs? Agamemnon wrote: I have done professional WIKI work in my old job, we had an internal company wiki server for all of our security operations support needs. Easy click and lookup How to sections...Look up for processes etc and check lists. Ag, if you could update the ships page, that would be great. Not sure if we need modules for each ship. I think just a list of the ship level module requirements and then the ones you can put any level in. Also it would be good to add the NPC ship requirements there too. Teddga did a great job on the NPC page and duplicating is not good, but either add a link or list it again on the ships page. Hubes was right, we need to add a DLC info on the hawk and bow. These are helping to increase revenue for the game. That is important. Someone would need to get screenshots of how to get DLC. I have never had the option, so if someone else could get that. Even full screenshots that we can edit would be fine. F12 in Steam if I remember correctly. They can not be posted here, but you can post a link and we can get them that way. HUBES!!! I know you were laughing the whole time you posted this!!! I am going to wait till the midpoint is found, then really take a hard look at a redesign. Marsanghas wrote: On the wiki http://wiki.thespacegame.com/mediawiki/index.php/Completing_Contracts there is a picture with Deep6 Blueprints for sale there. Can someone get a good screenshot of the complete list? I suspect the new buildings will be researched and this list should be fairly consistent for a while. The Peoples New Eden Alliance. We learnt from history.